7. 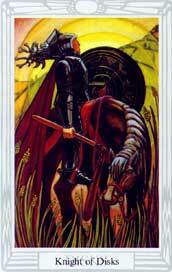 The King of Wands is "The Prince of the Chariot of Fire." Which one has a Lion? A Kingly figure with a golden winged Crown, seated on a Chariot. He has large white wings. One wheel of his chariot is shewn. He wears corselet and buskins of scale armour, decorated with winged Lion's heads, which symbol also surmounts his crown. 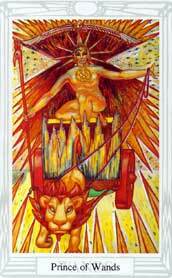 His chariot is drawn by a lion. His arms are bare, save for the shoulder-pieces of the corselet, and he bears a torch or fire-wand, somewhat similar to that of the Zelator Adeptus Minor. Beneath the Chariot are flames, some waved, some salient. ... He rules the Heavens from above the last decan of Cancer to the 2nd decan of Leo. Hence he includes most of Leo Minor. Air of Fire. Prince and Emperor of Salamanders. 11. 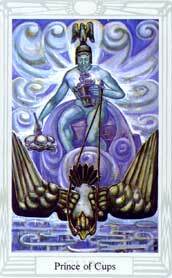 The King of Cups is "The Prince of the Chariot of the Waters." Neither of RWS has an Eagle, but which one has a Lotus? A winged Kingly figure with winged crown seated in a chariot drawn by an Eagle. On the wheel is the symbol of a Scorpion. The Eagle is borne as a crest on his crown, cuirass and buskins. 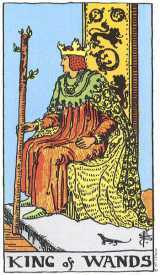 General attire like King of Wands. Beneath his chariot is the calm and stagnant water of a Lake. His scale armour resembles feathers more than scales. He holds in one hand a Lotus, and in the other a Cup, charged with the sigil of his scale. A serpent issues from the Cup, and has its head tending down to the waters of the Lake. ... He rules from 20 degrees of Libra to 20 degrees Scorpio. Air of Water. Prince and Emperor of Nymphs and Undines. 15. 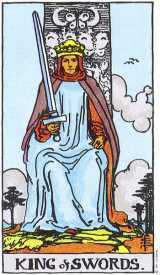 The King of Swords is "The Prince of the Chariot of the Winds." Which one has butterfly-winged fairies and sickles? A Winged King with a winged Crown, seated in a chariot drawn by Arch Fays, archons, or Arch Fairies, represented as winged youths very slightly draped, with butterfly wings, heads encircled by a fillet with Pentagrams thereon, and holding wands surmounted by pentagram-shaped stars. The same butterfly wings are on their feet and fillet. 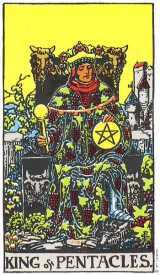 General equipment is that of the King of Wands, but he bears as a crest, a winged Angelic Head with a Pentagram on the Brow. Beneath the chariot are grey rain clouds, or nimbi. His hair long and waving in serpentine whirls, and whorl figures compose the scales of his armour. A drawn sword in one hand; a sickle in the other. With the sword he rules, with the sickle he slays. ... Ruler from 20 degrees Capricorn to 20 degrees Aquarius. Air of Air. Prince and Emperor of Sylphs and Sylphides. 19. 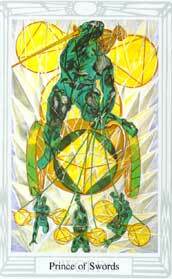 The King of Pentacles is "The Prince of the Chariot of Earth." Which one has a Bull? A winged kingly figure seated in a chariot drawn by a bull. He bears as a crest the symbol of the head of the winged bull. Beneath the chariot is land with many flowers. In one hand he bears an orb of gold held downwards, and in the other a sceptre surmounted by an orb and cross. ... Rules from 20 degrees Aries to 20 degrees of Taurus. Air of Earth, Prince and Emperor of the Gnomes. 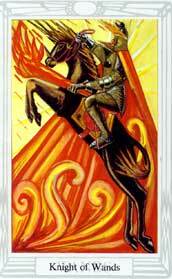 The Knight of Wands is "The Lord of the Flame and Lighting: the King of the Spirits of Fire." Which one rides a horse and wears a helmet? A winged Warrior riding upon a black Horse with flaming mane and tail. The horse itself is not winged. The Rider wears a winged Helmet (like an old Scandinavian and Gaulish Helmet) with a royal Crown. A corselet of scale-mail and buskins of the same, and a flowing scarlet mantle. Above his helmet, upon his cuirass, and on the shoulder-pieces and buskins he bears, as a crest, a winged black Horse's head. He grasps a Club with flaming ends, somewhat similar to that in the symbol of the Ace of Wands, but not so heavy, and also the Sigil of his scale is shewn. Beneath the rushing feet of his steed are waving flames of Fire. ... He rules the celestial Heavens from above the 20th degree of Scorpio to the First two Decans of Sagittarius and this includes a part of the constellation Hercule (who also carries a club). Fire of Fire. King of the Salamanders. 9. 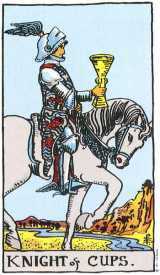 The Knight of Cups is "The Lord of the Waves and the Waters: the King of the Hosts of the Sea." Which one rides a horse and wears a helmet? 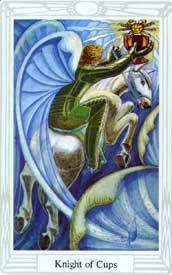 A beautiful youthful winged Warrior, with flying hair, riding upon a white Horse, which latter is not winged. His general equipment is similar to that of the Knight of Wands, but upon his helmet, cuirass and buskins is a peacock with opened wings. He holds a Cup in his hand, bearing the sigil of the Scale. Beneath his horse's feet is the sea. From the cup issues a crab. ... 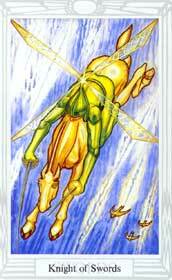 He rules the heavens from above 20 degrees of Aquarius to 20 degrees Pisces, including the greater part of Pegasus. Fire of Water. King of Undines and of Nymphs. 13. 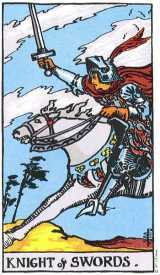 The Knight of Swords is "The Lord of the Wind and the Breezes: the King of the Spirits of Air." Which one rides a horse and wears a helmet? Which shows driving stratus clouds? A winged Warrior with crowned and winged Helmet, mounted upon a brown Steed, his general equipment is as that of the Knight of Wands, but he wears as a crest a winged six-pointed star, similar to those represented on the heads of Castor and Pollux, the Dioscuri, the Twins - Gemini (a part of which constellation is included in his rule). He holds a drawn sword with the Sigil of his Scale upon its pommel. Beneath his Horse's feet are dark, driving, stratus clouds. ... Rules from 20 degrees Taurus to 20 degrees Gemini. Fire of Air. King of Sylphs and Sylphides. 17. 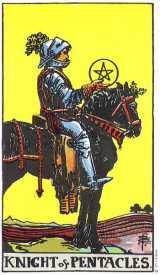 The Knight of Pentacles is "The Lord of the Wide and Fertile Land: the King of the Spirits of Earth." Which one rides a horse and wears a helmet? Which shows grain fields? A dark winged Warrior with winged and crowned helmet; mounted on a light brown horse. Equipment as of the Knight of Wands. The winged head of a stag or antelope as a crest. Beneath the horse's feet is fertile land, with ripened corn. 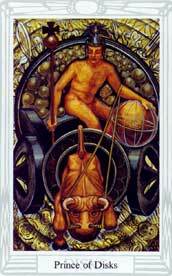 In one hand he bears a sceptre surmounted with a hexagram, in the other a pentacle like a Zelator Adeptus Minor's. ... Rules from above 20 degrees of Leo to 20 degrees of Virgo. Fire of Earth. King of the Gnomes. The Four Kings or Figures mounted on Steeds represent the Yod forces of the Name in each Suit, the Radix, Father and commencement of Material Forces. A force in which all the others are implied and of which they form the development and completion. A force swift and violent in its action, but whose effect soon passes away, and therefore symbolized by a figure on a steed riding swiftly, and clothed in complete armour. 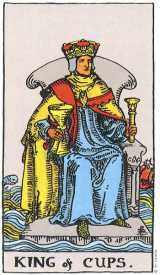 Therefore is the knowledge of the scale of the King so necessary for the commencement of all magical working. These Princes are figures seated in Chariots, and thus borne forward. They represent the Vau Forces of the Name in each suit; the Mighty son of the King, and the Queen, who realizes the Influence of both scales of Force. A prince, the son of a King and Queen, yet a Prince of Princes, and a King of Kings. An Emperor whose effect is at once rapid (though not so swift as that of a king) and enduring (though not as steadfast as that of a Queen). 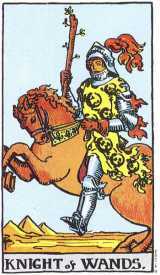 It is therefore symbolized by a figure borne in a chariot, and clothed with armour. Yet is his power illusionary, unless set in Motion by his Father and Mother. This page is my visual argument one of my pet peeves in published Tarot writing. I believe that many Tarot authors have gotten the correspondence between Thoth and traditionally structured decks (like the RWS) WRONG. I believe that if one goes all the way back to the source of Thoth's court structure, the writings of the Golden Dawn, and reads slowly and carefully to understand what is there, the correspondence between a Golden Dawn compliant deck, like Thoth and a traditionally structured deck, like RWS can only be made one way. And that one way is not by merely lining up Knight, Queen, Prince, Princess above King, Queen, Knight, Knave. Rather, it is necessary to equate the elemental correspondences, and this requires reordering the traditionally structured court to Knight, Queen, King, Knave if one intends to make an equation by order rather than element. So long as the author is not relying on any other part of the Golden Dawn scheme of the court cards, or is not making comparisons between Golden Dawn or Thoth variants and other decks, it doesn't really matter. But as soon as they start talking about which card rules 20 degrees of Leo to 20 degrees of Virgo, or which card represents the Vau part of the Name, it make a big difference if they have gotten confused about whether they are looking at a Knight or a Prince. Note that this argument is really only stating one direction of the correspondence between Thoth and RWS. RWS is shown simply as a traditionally structured court of King, Queen, Knight, Page, and Crowley was specific about how his court compared to a traditionally structured court. I am not stating that Waite intended this correspondence between his deck and the GD court structure, because it is not clear what his intentions were from his writings. But it is interesting how many of the regalia mentioned in Book "T" can be found in the Waite courts in subtle ways, such as engraved onto the thrones. This regalia is only found if lined up according to Book "T"'s specification - that, for instance, 'The King of Wands is "The Prince of the Chariot of Fire."' Did Waite intend this? I don't know. Did PCS stick it in on her own? I don't know. Is it purely coincidence? Could be. Regardless, if you are making statements interpreting the RWS as a Golden Dawn deck, then the Golden Dawn scheme that maps traditionally structured courts onto its system of is done as I have laid out here.